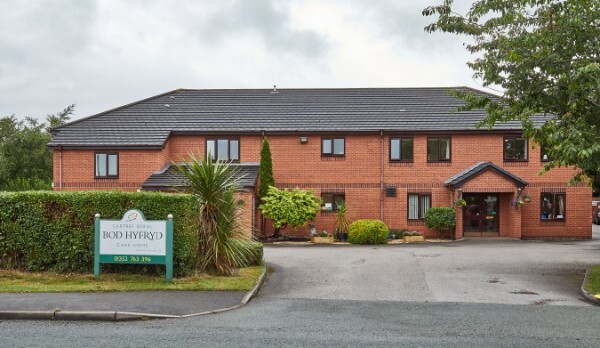 Bod Hyfryd is a 41-bed home offering an exceptional level of person-centred care and the highest quality of life to our residents. Nestled in the foot of the Clwydian Fells, the home and gardens have unrivalled views across the beautiful Welsh countryside. Our team spends time learning about our residents’ life stories and then undertaking reminiscence work with them. This helps us to connect with our residents on a personal level and build trust with their family and friends too. We involve our residents in the design and planning of our gardens throughout the seasons and we have a packed activities programme. Meanwhile, our residents get to choose from a wide selection of dishes each meal time. Menus are designed not only to be nutritionally well-balanced, but also tasty and matched to every resident’s preferences. Life in our team means being passionate, dedicated and resident focused. Our General Manager and nurses always welcome our new arrivals and our chefs make a point of meeting every new resident to get an idea of their likes and dislikes. Whatever your level, we’ll make sure you have the training and development to achieve your own goals as well as building on our reputation for delivering the highest standards of care. We’re based in the Mount Pleasant area of Flint, just off the A5119. Flint town centre and train station is less than a mile away. Why work at Bod Hyfryd Care Home in Flint? We provide 24-hour nursing and specialist dementia care as well respite care and short breaks. Our brand new Memory Lane Community provides specialist resources for people living with dementia in a homely yet secure environment. This includes colour and cues to help residents navigate through the home as well as thoughtful interior design to help with reminiscence.